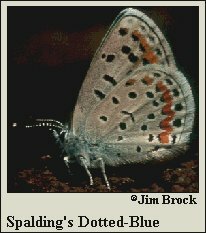 Identification: Upperside of male blue with wide dark border; female brown with orange band on both fore- and hindwings. Underside of both sexes gray with black spots and orange marginal bands on both wings. Life History: Males patrol erratically for females. Caterpillar Hosts: Eriogonum racemosum in the buckwheat family (Polygonaceae). 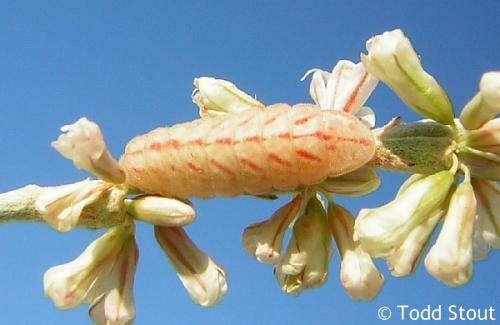 Adult Food: Nectar from flowers including Eriogonum jamesi. Habitat: Rocky outcrops on elevated pinyon-juniper plateaus. Range: Northeastern New Mexico, northern Arizona, southwest Colorado, Utah, and western Nevada. Conservation: Many populations on public lands are not in need of specific protection. Management Needs: Monitor populations and habitats for invasion of exotic plants such as cheatgrass.